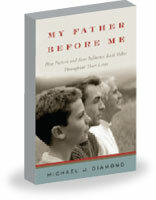 Frequently Asked Questions FAQs Father Son Relationship Expert Michael J. Diamond, Ph.D. Please briefly describe what you do? What inspired you to write the book, My Father Before Me? Why has the father’s role in raising his childrenespecially sonsbeen largely ignored? How so and what role does a son play in his father’s emotional life? How are men “born” into fatherhood and what changes are occurring in them as they enter the world of parenting? What are some common misperceptions of masculinity? What can women take away from your book and what can they learn about their husbands and sons? Is it important that father's capitalize on the period of time during which his son idolizes him and why? What happens to the father son relationship during adolescence? What should fathers do during this time of enormous change in their sons? You state in the book that fathers of teenage boys struggle with their own identities as well as with their sons’. Why is that and how can men better cope with the changes happening in their lives? You have experienced this (Adolescence) from both sides of the fence, as both a father and a son. How is it different? How is the experience the same? What would you like fathers to know about their adolescent sons? What do young men expect and want from their fathers as they begin the transition away from home? What are some of the key ways in which men change emotionally as they age? What can moms do to help foster the father son relationship? How long have you been married? How does your wife support you in your work? How can we reach you to schedule a lecture or workshop? I am a psychoanalyst and clinical psychologist in private practice in Los Angeles, CA; a training and supervising analyst at the Los Angeles Institute and Society for Psychoanalytic Studies; and, an Associate Clinical Professor of Psychiatry at the University of California at Los Angleles. I have two children, Maya (age 22) and Alex (age 20). What inspired you to write the book, My Father Before Me, and why did you decide to write it when you did? To actually write this book, I drew on my more than thirty years’ experience as a practicing psychotherapist, couples therapist, and psychoanalyst with specialized work in the father-son relationship. The text is based on my clinical observations and research findings, reinforced by case histories from my practice. In particular, there are three primary circumstances that led to the actual writing of this book: (1) the emergence of my own children into young adulthood and “leaving the nest;” (2) a coalescing of my professional study, teaching and writing on fathering and masculinity for nearly thirty years; and, (3) a strong need to “give back” to the broader circle of men (and women) my acquired understandings of fathers and sons throughout the life cycle. Until your book, the majority of literature focused on how mothers influenced their children. Why has the father’s role in raising his childrenespecially sonsbeen largely ignored? There are many reasons why fathers had become the "forgotten parent." Despite the apparent timelessness of the father-son bond -- and more generally, the father-child connection – a sense of its power and closeness have waxed and waned over time. In agrarian society, for instance, fathers were very involved in their children’s lives. Yet by the end of World War II, fathers were seldom thought of as contributing to their children’s healthy development. Instead, they were more notable for their absence, or for their destructive impact, as when they were abusive, neglectful, or dead. Effective fathers were not only absent from the popular imagination, but from the professional literature as well. Scholarly papers documenting mothers, motherhood, and a mother’s impact on her children abounded; social scientists unwittingly devalued the father’s role, and research on fathers was scant. Our tendency to ignore or discount a father’s influence began to change in the 1970s for several reasons. With the first stirrings of the women’s rights movement and an outpouring of feminist theory, huge social upheavals ensued. Until then, many otherwise well-qualified women were kept from equal status in the career workplace and consequently were more relegated to the background. At the same time, women were valued primarily in the domestic sphere and regarded as more "expert" in the domain of childrearing. As a result, mothers were often "blamed" for what went wrong with the children while fathers were held largely unaccountable. However, as women flocked to join the work force and families adapted to support dual careers, men had to become more active parents, causing gender roles to become more flexible. At the same time, changes in obstetrical and pediatric practices enabled fathers to become more directly involved in pregnancy, delivery, and pediatric care. Lamaze natural childbirth classes, for example, which became very popular during this era, welcomed fathers as pregnancy coaches, and trained them to assist during birth as well. Finally, thanks to advances in the techniques of behavioral and psycho-physiological observation, researchers studying infants began to examine the importance of the father-child bond. Today we recognize that fathers have a unique and essential role to play in raising children. A father does not merely supplement what a mother does but complements her role. He has an important impact on his child deriving from his fatherliness, from the fact that he is a man, extending from the day of conception, beyond his own death, until the day his child dies. A central message in your book is that fathers and sons are on parallel journeys throughout life and that fathers grow, change, and develop as much as their sons. How so and what role does a son play in his father’s emotional life? Fathers and sons share a basic biological resemblance and their unique bond naturally emerges from the ease of identifying with the other’s maleness. In part, because of this intense mutual identification, a father and his son have an especially multifaceted impact upon one another throughout their lives. In their complex interaction, the father influences the way his son develops, and simultaneously, his son affects the way that his father handles his own parallel transitions. Thus, for example, to become guardians of infants, fathers assume a new set of responsibilities and are challenged to redefine their sense of masculinity. As a liaison for their sons entry to the larger world, men learn to appreciate “otherness”, that is, to recognize that other people have an existence apart from theirs, which is the root of empathy. When boys need their fathers to become models and to approve of their behavior, men are called upon to develop their sense of paternal authority and personal responsibility. As boys contend with the "oedipal stage," their fathers confront, contain, and more appropriately express their own difficult emotions, particularly aggression, envy, jealousy and competitiveness. For their elementary school aged sons who need guidance, fathers are asked to develop their ability to teach and guide. Fathers of teenage boys learn to ride the roller coaster – to maintain their emotional equilibrium – to modulate their vulnerability -- in the face of their sons’ adulation and subsequent devaluation. As boys turn to young men, fathers begin to learn the lessons of "letting go" and surrendering their authority – a significant loss -- to their sons’ burgeoning autonomy. As the father of adult sons, fathers learn to confront their own dependency needs, and to find ways to leave a legacy that will survive their own death as mentors to their grandchildren and future generations. Finally, fathers learn to face and accept their own death, frequently through the help of their older sons. Throughout this process, as fathers actively parent their sons, they also have the opportunity to reconcile with and resolve unfinished business with their own fathers and mothers. Moreover, by becoming and staying involved in fathering, men undergo emotional, psychological, moral and even physical changes. In fact, engaged fathers tend to be more emotionally available, more open-minded and flexible, and healthier (they even live longer). You have a chapter titled “A Father is Born.” How are men “born” into fatherhood and what changes are occurring in them as they enter the world of parenting? Fatherliness has instinctual roots and indeed, most every man has the capacity to develop his fatherly ties to his children. Despite its instinctual basis, however, the specific benefits of fatherhood don’t come so automatically. Many men, unlike women, need to learn to become responsible fathers and to guide their sons along the same pathway. Fathers often have to work hard to develop the ability to nurture – and they can do so by becoming actively engaged in their lives of their children. By doing so, they not only become involved in their child’s external activities, but they become more attentive to their child’s as well as their own inner lives. Good enough fathers consequently find themselves growing more empathic, vulnerable, and trusting while helping to guide and mentor their child to take on the challenges of the world, regulate emotions, and achieve mastery in certain realms of activity. Your book sheds new light not only on how we view and understand fatherhood but also on the notion of masculinity. What are some common misperceptions of masculinity? In what ways does a father guide his son to manhood and how does being engaged with his son change a father’s attitude toward his own masculinity? In our culture, it is not enough to be a man biologically. Masculinity has to be proven over and over again. Essentially, the most important thing about being a man comes down to the fact that a man is not a woman. In this light, masculinity has become a zero sum game: a male can claim to be masculine only by completely renouncing femininity. This culturally propagated idea not only leads to misconceptions and misperceptions of masculinity, but also creates untoward problems for boys growing up and for the men they become. Involved fathering of sons provides both the father and son with a broader and more flexible sense of masculinity that is rooted in the understanding that men need to acknowledge and accept all aspects of themselves, including those that society identifies as “feminine,” as inherent components of one’s masculinity. It’s important to note that I am not arguing simply for a “kinder and gentler” masculinity; rather, this new view of masculinity sustains the paradoxical interior realities of a man’s experience that both masculinity and femininity commingle throughout a man’s life. This paternal guidance to manhood and the development of a more flexible sense of masculinity occurs in different ways throughout the son’s development. We see it in particular when an engaged father empathizes with his son’s need to move away from his mother while simultaneously offering a healthy alternative love object: himself. A major part of successfully showing his son the value of embracing this new relationship is by making obvious the similarities inherent in being male, which ultimately helps the boy slowly grasp a healthy sense of his gender identity. For example, even though many boys learn to use the toilet at an earlier age, only now do they begin feeling pride (and pleasure) during the experience of urinating while standing. They also recognize that they are doing something their fathers can do while their mothers, quite obviously, cannot. This new skill enables them to focus on being more like dad rather than on “pleasing mommy.” Furthermore, when the father presents himself as a male model of bathroom behavior—which includes, in addition to urinating standing up, shaving his face—the boy can absorb the elements that make adult males “unique.” Differentiating himself from his mother is thereby encouraged while the privacy reminiscent of the bond boys had with their mothers becomes less important as the male model of “peeing” together takes precedence. This signals the beginning of a boy’s enjoyment of male bonding. By creating a safety zone in which boys can express their autonomy, curiosity, and aggression, fathers pass on to their sons another lesson: that masculinity also has a soft, nurturing, and protective side. Previously boys associated these caring qualities with their mothers, but now, as boys realize that their dads take care of them as well, they recognize that affection and caretaking are not exclusively feminine qualities. Instead of renouncing all of his “soft” qualities, he can hold onto these traits and still think of himself as a “man” like his father because he no longer associates them solely with his mother. The father also acts as an agent of moderation for his son, encouraging the boy to move away from an “all or nothing” position regarding the so-called “feminine” parts of himself. Boys with this insight develop a conception of their masculinity that is not rigid or fixed but varied; their sense of maleness isn’t an “either/or” proposition, but rather a complex mixture of multiple identifications with both parents. He does not see “masculinity” and “femininity” as being so disparate or on opposite ends of the spectrum. When he can integrate qualities from both his mother and his father while simultaneously recognizing that he is an autonomous being who is not identified exclusively with either parent, a boy can differentiate himself from his mother more naturally. As fathers continue to engage with their sons, they too are expanding their notions of masculinity. No longer an either-or proposition, a loving father is able to access and further develop his relational abilities to nurture, protect, understand, and let go by remaining in the background when necessary in order to promote his child’s growth. “Proving” his own masculinity is subsumed by a more central task – namely, helping his son to develop into a healthy, happy and successful human being who is aware of but not so constrained by the dictates of culture. Women can learn to better understand and appreciate the men in their lives – whether husbands, sons, or their own fathers. This book will enable women to develop their understanding of men and as they learn to guide and support their sons on their unique journeys, their relationships with all these key people can improve over time. In short, women (and men) can become better parents and partners, and better adult children to their own aging parents. It is important that a father capitalizes on the period of time during which his son needs him -- and this occurs throughout the boy's development, not only when he idolizes his father. Research has shown that the earlier the father becomes involved with his son, the more likely it is that the son will develop in healthy, constructive ways. Sons need specific provisions from their fathers throughout their childhood, adolescence and young adult years and can benefit as well when a father is available to do so throughout his son's maturing adult years. In terms of the period of idealization, I have found that sons especially need their fathers when they cease to idealize them -- namely in mid-late adolescence when fathers fall from grace, from heroes to fallen heroes. During this time, fathers are called upon to bear the de-idealization (and their sons' experimentation with new identities and new "heroes") without becoming too narcissistically wounded or punitive. This process whereby the father is less likely to be regarded as an ideal will necessarily continue in the son’s young adulthood and beyond. What are some of the emotions they are teenage boy grapple with? What happens to the father son relationship during adolescence? Generally speaking, adolescent boys have to come to terms with their changing bodies, outrageous urges, and radically altering minds. They begin to formulate their own identities, separate from their families, and begin to come to terms with their feelings of loss. The father-son bond unavoidably changes radically during adolescence. Until now, if a father has been available and good enough, he and his son most likely enjoy a rather steady, congenial relationship, a continuation of their childhood ties. But during a boy’s adolescence, his feelings about his father become more volatile and unpredictable. Young teenage boys look up to their fathers, often idealize them, as they search for models to guide them through their identity confusion. By middle adolescence, boys often become much more critical of their fathers, paving the way for yet another change in late adolescence, when boys tend to not only distance themselves from their dads but devalue parental authority. As you state, when many boys become teenagers they push their fathers “off the pedestal” and fathers go from “hero to fallen hero.” What should fathers do during this time of enormous change in their sons? It’s a difficult time for fathers, many of whom are confronting their own discontents, worries and surprises that are common to a man in his middle age. As they begin to accept the fact that they have lost their “young” boys as well as youthful versions of themselves, they contend with loss, impotence, resignation, and their own mortality. Though they may fight and frequently seem at odds, fathers and their teenage sons are in fact struggling with the very same issues of identity, differentiation and loss. For their part, fathers need to find ways of dealing with this distancing in a manner that supports rather than undermines his son’s need to separate. As their teenage sons struggle with independence, middle-aged fathers are engaged in a parallel struggle. His identity as a “younger man” is changing; he’s beginning to accept himself as a more mature, middle-aged man. Thanks to his involvement with his son, he’s vicariously rediscovering the circular, transitional and changing nature of his own life’s journey, recognizing life’s painful losses, frightening changes, and exciting opportunities for growth that persist no matter how old we are. You state in the book that fathers of teenage boys struggle with their own identities as well as with their sons’. Why is that and how can men better cope with the changes happening in their lives? In particular, since midlife for men can be a very challenging time, how do fathers and sons affect one another during a man’s midlife transition and what are some of the unique ways they interact on a man-to-man level? As middle aged fathers begin to accept the fact that they have lost their “young” boys as well as youthful versions of themselves, they contend with loss, impotence, resignation, and their own mortality. Nonetheless, there is something strangely similar for both father and son during a son's adolescence. In short, both are struggling with issues pertaining to identity, change, and uncertainty. In this respect, there is something that both a father and son reciprocally share in terms of further individuating or differentiating from the self that each had grown familiar with -- that is, for the adolescent boy, he is no longer the little boy he once was -- for the man in midlife, he is no longer the younger adult man that he had grown accustomed to. Through sharing these experiences of transition and change, father and son are actually in tandem without realizing it. In the man-to-man interchanges during this period of time, one can hear the excitement and fears of change as well as the background of loss that both contend with. An understanding of this fact on the father’s part can render the challenges of limit-setting and sufficient support a bit easier if not smoother. The experience is of course quite different in the respect that as a father, the mature man is able to empathize with and vicariously identify with his son's teenage struggles. When an adolescent myself, I naturally lacked in the capacity to reflect broadly and deeply upon my own experience and similarly, lacked the experience to understand where my confusions and uncertainties might lead. In contrast, my father might have been able to observe my experiences with a greater sense of perspective and comfort. Another important difference is that the father at mid-life is now beginning to make a descent, both physiologically and psychically. In stark contrast to this descent, the adolescent boy is typically in full ascent in moving towards his peak intellectually, physically, and in emotional ways. It is very important for fathers to bear and constructively handle their own typically more unconscious feelings of loss and envy that are triggered by this difference. These differences notwithstanding, there is nonetheless something strangely similar for both father and son during a son's adolescence. For example, like most fathers in their mid-life with teenage boys, I too found myself struggling like my son with issues pertaining to identity, change, and uncertainty. In this respect, there is something that both a father and son reciprocally share in terms of further individuating or differentiating from the self that each had grown familiar with -- that is, for the adolescent boy, he is no longer the little boy he once was -- for the man in midlife, he is no longer the younger adult man that he had grown accustomed to. Through sharing these experiences of transition and change, father and son are actually in tandem without realizing it. Fathers need to appreciate that their sons are struggling with their own needs to establish an identity of their own -- a need to feel separate from their parents, and yet simultaneously, are experiencing considerable anxieties of their own about losing their ties to their families. This ambivalence coupled with their radically changing teenage bodies, outrageous urges, and continually altering ways of seeing the world makes for a time of turbulence, confusion, and the need for understanding, firmly supportive and limit-setting fathers. When children reach the edge of adulthood, you write that fathers need to “coach from the sidelines.” How is that helpful and what does it require from the father? What do young men expect and want from their fathers as they begin the transition away from home? On the brink of adulthood, young men need to begin to create an autonomous life where they can experience themselves as adult men able to function independently, apart from their families. This entails finding their place in the world (which includes creating a career direction), and forming intimate, lasting love relationships. Neither is easy. Unsure of what role to take, fathers need to adapt to long-distance fathering in which they withhold judgment and leave much of the direct mentoring to other older men who his son seeks to learn from. However, because they may be summoned at any time to help their sons venture further into the adult world, fathers need to remain poised and ready on the sidelines to step in at a moment’s notice. You offer a chapter on how fathers and sons reverse roles in later life. What are some of the key ways in which men change emotionally as they age and how does that affect the father/son relationship? Men in their late-forties, fifties, and sixties and beyond are coming to terms with their own physical and emotional limitations as well as the death of their heroic aspirations. During middle age and later life, men experience a developmental need to reclaim those less action-oriented, receptive parts of themselves that were necessarily constricted in order for them to achieve sufficient mastery in the world and accommodate to society’s ideal of manhood. They need to reconfigure the boyish, ever-youthful parts of themselves so that they can successfully face the aging process in their years ahead. As a result of the biological and psychological changes occurring during this time, many men no longer are driven to prove their manhood but instead are freer to more fully be themselves. In the second half of life, most men naturally begin to turn inward as their sense of certainty is being dismantled. Rather than pursuing specific goals and trying to master his environment—important goals throughout his formative years—the man at mid-life is increasingly oriented toward enjoying the process of living. This inward journey of later life often involves acknowledging mistakes and weaknesses, as well as revealing secrets. With the waning of the “heroic” version of himself that he created to succeed in the world of younger adults, a man’s experiences of himself as the “center” of his heroic journey is coming to an end. When he can accomplish these tasks of life’s second half, he is less likely to view his life with a sense of despair or defeat and instead, he remains accepting and hopeful, eager to find new ways to become generative and creative. It is not uncommon for middle-aged men and their elderly fathers to find their relationship taking a difficult, oftentimes awkward turn. After years of stability and equality, the scales have tipped as older men increasingly depend on their sons for physical, emotional, and at times financial support. This reality — that sons ultimately end up parenting their own fathers often at the same time that they are still parenting their children—can cause great anguish for both father and son. Yet, ironically, this is also a time during which both men find themselves closer than they’ve been in years. Facing their mortality, feeling the urgent need to make good use of the time left to them, father and son are ready to give up past illusions and come to grips with what’s real and important in their lives. They find themselves coping with similar changes and, as a result, they arrive at comparable realizations, such as the shared understanding of how important it is to remain generative and helpful to others, and to find constructive ways of grappling with their complex feelings about one another and possible despair over aging. Because of this congruence, they are particularly well-suited to share with and support one another, as well as to forge new and deeper connections. The most rewarding facet of fatherhood is to remain engaged with my children and observe them develop in their own unique ways. Sharing "quality time" and activities together, communicating openly, expressing love, constructively dealing with conflict and disagreement, and seeing how something valued from myself (or my wife) is being carried forward in our children is deeply gratifying -- and most particularly witnessing our children experience life's joys as well as the inevitable disappointments in honest, authentic, and generous ways. There is something deeply gratifying in the reciprocal development that occurs when a father remains constructively involved with his maturing child. I have been married twenty-six plus years to Linda and indeed she greatly supports my work (and my involvement in parenting our children). Perhaps this support is best expressed by citing what I said in the book's Acknowledgments: "And most significantly, my appreciation is immeasurable for my wife and closest friend, Linda, who supported my work on this project in inestimable ways, including a thorough and critical reading of the manuscript in process, while challenging me as only a highly trusted, trustworthy, and loving partner can do." I am available for lecturing and consulting on fathering, father-son and father-daughter relations, parenting as well as on male development. I also am experienced in corporate and family business consulting and do a great deal of consulting in the clinical areas of psychoanalysis, psychotherapy and couples therapy. We would like you to come and speak for our university, corporation, firm or the like. How can we reach you to schedule a lecture or workshop?